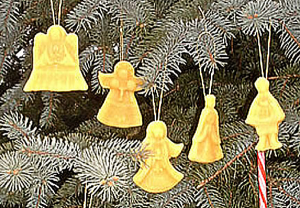 What to do with Beeswax Tree Ornaments? Seems pretty obvious doesn't it? + Of course the number one reason was to decorate your Christmas Tree. 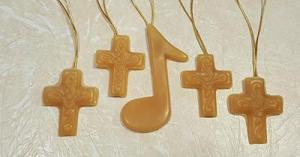 + Place settings - the gold cord on the decoration was used to wrap the napkin together - Use for Christmas Dinner. + Wrapping party gifts - add as a decoration. + Christmas Handouts to postman, UPS etc. 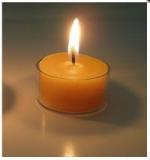 Scented or Natural Votives and Tea Lites until the end of the year! 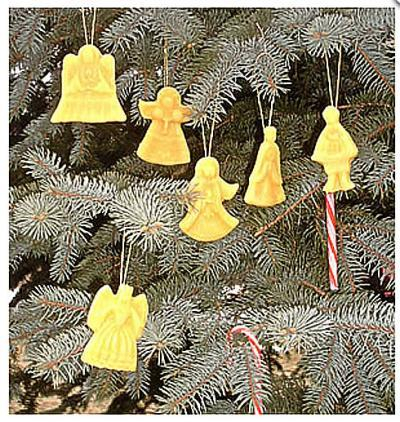 Beeswax Votives and Tea Lites are available in Packs of 6 or Bulk Packs of 24. 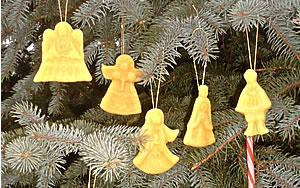 I just made a new batch of Christmas Pine Votives & Tea Lites, scented with Fir and Lemongrass Essential Oils. Do they smell Great! We just received a large order of soap from our Colorado Soap maker, Laurie Teason (Sweet Cheeks Company). All of her soaps are Organic. Our other soap maker (Susan Grieves of SAP) is from the Shores of Lake Michigan - across the State from us. They are made from vegetable oils using a centuries old process called the cold batch method which retains the skin softening effects of natural glycerine. We have soaps in 5 different scents - $9.00 each bar or 3 or more bars for $8.00 each. 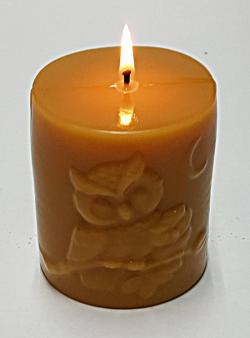 Visit our Candle Shop for more Holiday Items! To unsubscribe from this newsletter, click this [unsubscribe link]! Or update your name, email and group subscriptions via [manage subscriptions]. Bring your Pails and Buckets! WE ARE ENTERING INTO THE LAST 3RD OF OUR SEASON AND EVERYTHING IS RIPE. WE MAY BE CLOSING IN A FEW WEEKS. Come visit us at the farm when we are open on Fridays, Saturdays and Sundays! Please watch for Children and Families when driving in. Since many people are becoming more disgusted with Facebook censorship and sharing your personal data - people are moving to other Social Networks such as "Diaspora". There are fewer people on Diaspora, but it is growing. Instead of all of your data in on huge database, Diaspora uses "Pods" that are all over the country. Our pod is called "Natural News" which is health, farming related. There is also something "Aspects". Your life is made up of lots of different aspects, involving different people. Why should your online life be any different? With diaspora*’s aspects you can organize your online life as much as you want and share things only with the people you want to." 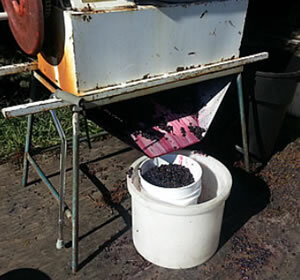 We have a crusher- de-stemmer (NOT A PRESS) available for you to use for free (after paying for your grapes). Make sure you bring a pail to take your crushed grapes home in. 1lb - 19 lbs 1.00/lb. 60lb - 1.5 bushel or more .90/lb. 120lb - 3 bushel or more .85/lb. 200lb - 5 bushel or more .80/lb. 300lb - 7-8 bu or more .75/lb. 400lb - 10 bu or more .70/lb. 500lb - 13 bu or more .65/lb. 600lb - 15 bu or more .60/lb. 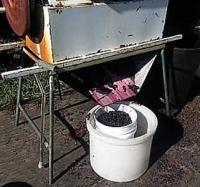 + Close-Out Sale on 2017 crop Concord Crushed Grapes - 5 gallon pails. 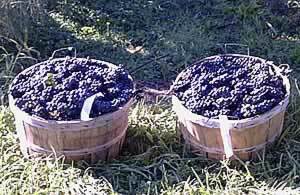 Below are some links to interesting winemaking articles from the "E.C. Kraus" & "Wine Turtle" websites. My Wine Hydrometer Reading Is Too High! Using Wine Cork vs Screw Cap: What’s The Difference? 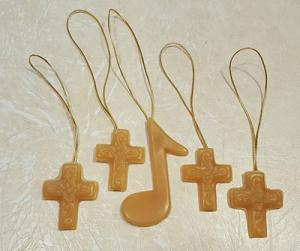 Our Beeswax Tapers are one of our Trademark items. Our Hand Dipped Tapers Image Gallery shows how we make them. 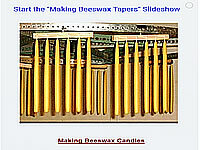 It shows every step in our candle making process when we make these Colonial Style Beeswax Candles. 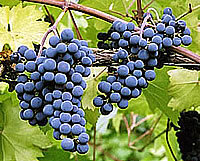 Grapes Will Soon Be Ready for you to Pick. 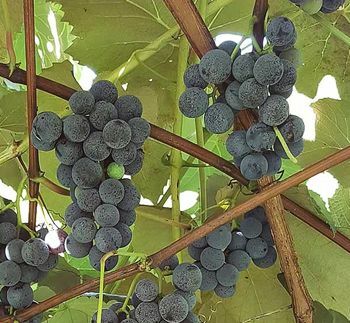 It's time to start picking wine, jelly and juice grapes. 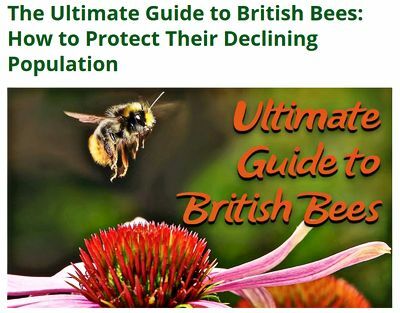 Perfect time to pick up your years supply of honey. Beeswax Candles are available at our Rustic Sales Stand. 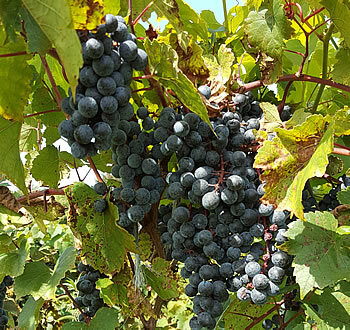 We will start picking grapes August 31 and continue until about mid October. We have a crusher- de-stemmer (NOT A PRESS) available for you to use for free. Make sure you bring a pail to take your crushed grapes home in. A good place to start when viewing our site is Our Timeline Page. It will summarize what is going to happen next at the Farm. 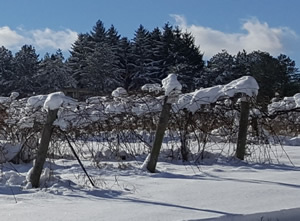 Good news this year - NO SPRING FROSTS! We did have a week of -15 degrees in early January and it did affect a few of the more sensitive varieties - but even most of them came through the winter just fine and have a crop. The Foch vines look really good. A lot of new Suffolk Red Seedless and Marquis White Seedless were planted, filling in missing vines and one new row of Marquis. We are trying to make most of the front of the vineyard seedless. Bulk Storing Wine In A Carboy - I have 5 gallons of wine that has just cleared up. Do I have to bottle it now or can I store it in the carboy? How long will the wine last in a carboy? Or will it spoil?I have 5 gallons of wine that has just cleared up. Do I have to bottle it now or can I store it in the carboy? How long will the wine last in a carboy? Or will it spoil? Spring is here. 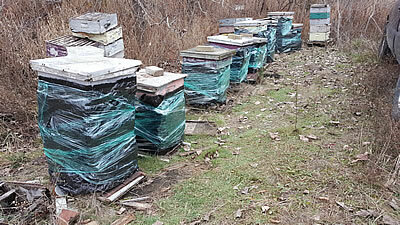 We just finished installing new honeybee colonies to replace winter loss. When I was getting ready to check the bee yards I tried to order some Terramycin, an antibiotic that beekeepers have used for the past 50 years to combat American and European Foulbrood. I found that you now need a prescription from a veterinarian to obtain it. At first I thought it was just more big brother interference in our lives - but it was to try to reduce antibiotics in our system. 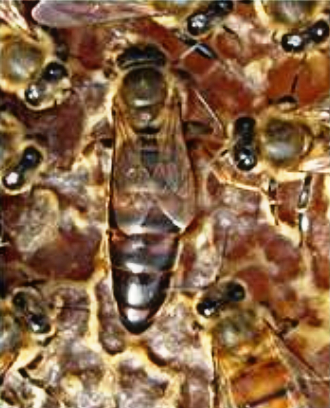 Without treating with terramyin there may be an increase in American Foulbrood which is very contagious and will kill the honeybees. A whole bee yard may be infected. The only treatment is to burn the hives - so we may be going back to a lot to hive burning. Upon more research, I found that when you stop using antibiotics, it changes the "gut" in the honeybees and they seem to winter over better. 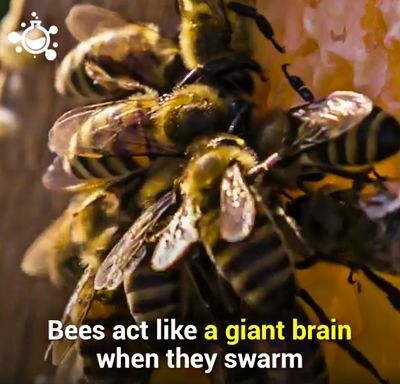 This could affect Colony Collapse Disorder. OUR ANNUAL FALL HONEY SALE - IN JUNE? FOR 30 DAYS ONLY! ALL HONEY PRODUCTS ARE ON SALE! 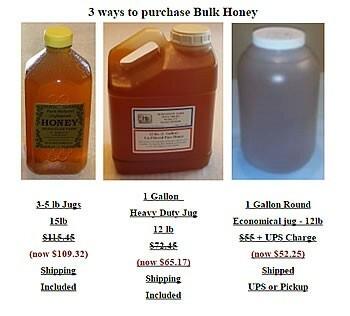 Many people have purchased a box with 3 - 5lb of honey (15lb) shipped to their door using a USPS FLAT RATE BOX. 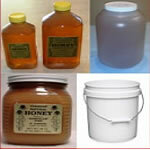 We can now use the same style of box to ship a rugged 1 Gallon (12lb) jug of honey! 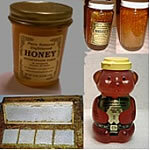 It is easy to order honey for pickup or shipped to you home. New Extra Large 4 inch wide Pillars - The largest single wick pillar on our site. Available in 4, 6 & 9 inch tall. 2018 is here, the vines and honeybees may be resting, but we are busy planning for a very exciting year! A good place to start when viewing our site is Our Timeline Page. It will summarize what is coming. Bill & Pat at the Beeswax Candle Shop want you to use our 25% coupon on plastic base tealites. 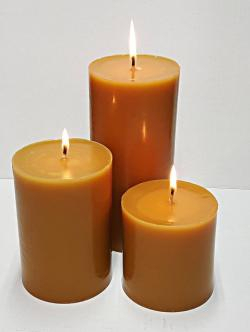 We have been Amazon Prime members for quite a while and decided to put our candles on their site. Or just go to Amazon and put "Honeyflow Farm" in the search block. Feel free to ask any questions about our products on the site, we do not have any reviews yet. I found some interesting things when looking for beeswax candles on Amazon. One major brand name advertised "Natural Beeswax Color" - however they did not have any beeswax in them. Winemaking Activities: I made some Seyval Blanc, Vignoles white and St.Pepin white last fall. About 5-10 gal each. Then near the close of the season I made a mix of NY Muscat and Foch - with lots of sugar for a higher alcohol sweet wine. We tend to use whatever is left at the end of the season for our own winemaking. I am in the process of racking the wines mentioned above. I am going to sweeten the St. Pepin and get 5 gallons ready to bottle. I will first rack them and add sulfite, then take one of the 5 gallons and sweeten it. This is where I would normally add Potassium Sorbate to hopefully retard fermentation. 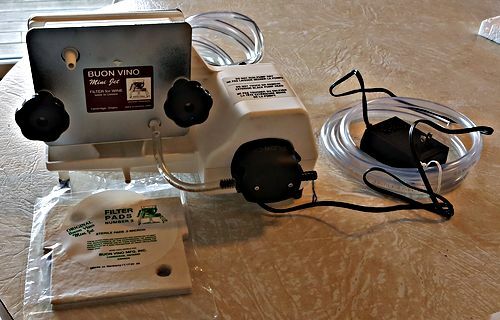 This year I purchase a new wine filter (about $100 + filter pads). I can filter out the yeast cells to prevent re-fermentation. Have any of you used winefilters before, this is my first use of them. Drop us a line..
NEW BEEKEEPERS - TSC NOW HAS BEEKEEPING SUPPLIES! If you are near a Tractor Supply Co store, they have a nice selection of Beekeeping supplies to get you started. They are even taking Honey bee orders for spring delivery (about $180/colony). We winterized our hives last fall with black bubble wrap and wrapping plastic around the whole hive to hold it together. We are hoping for better winter survival. We checked a few bee yards last week and still saw a lot of winter loss - we will have replacement package bees coming in spring. The honeybees do not like drafts just like people. The eat honey and shiver to keep the cluster warm. It may be 80 degrees or more inside the cluster. You can mentally picture the the winter cluster just like a family in winter. 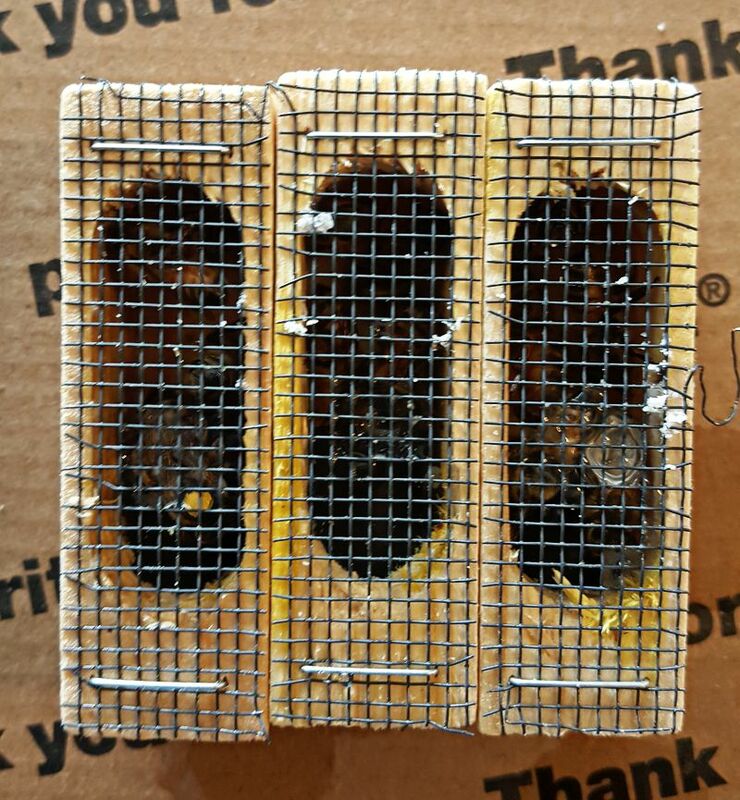 They stay inside, feed their flock (with stored honey & pollen), burn wood (honey) for heat and only go outside when it is warmer. To pick it up, just select "Local Pickup" when you check out of our Website Store and we will send you a message when your order is ready for pickup. May your day be filled with love and smiles. 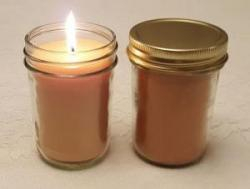 2 - A bulk pack of votives - and they are On Sale! 3 - A bulk pack of tea lites - and they are On Sale! 4 - A bulk bag of 24 Christmas Tree Ornaments for $28.70! 5 - Fragrance Candles in Natural, cinnamon, Bayberry, Holiday and Floral. And they are also ON SALE. 6 - A combination of Soap, Lotions, Bee Butter and Lip Balms are very popular. The Lavender shown is our best seller. 7 - Our 3.5 inch wide by 6 inch tall pillar is one of our most popular. 8 - Add a jar of honey to Lip Balms or Bee Butter for the perfect gift. 9 - It is easy to get Jugs of honey in the mail.